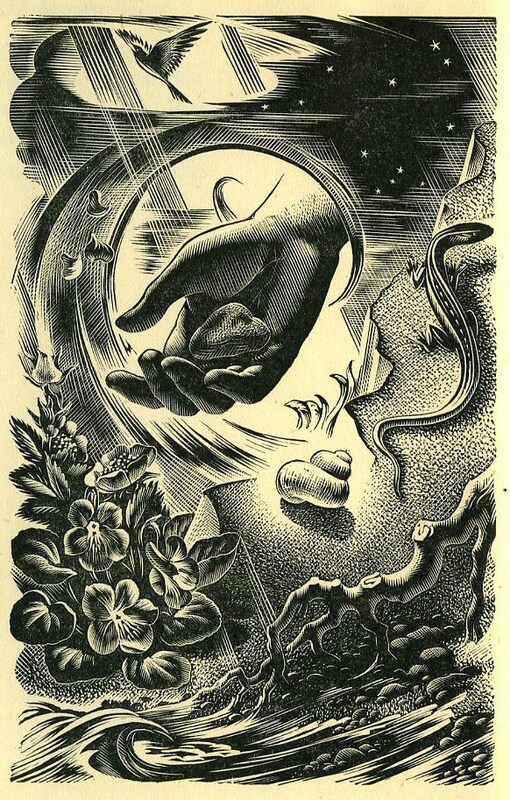 Woodcut by Agnes Miller Parker from 1947 “The Life of the Fields” via Brainpickings.com. whose questions prodded me to write what I’d felt, but hadn’t voiced. I am alone. I am besieged. I am vulnerable. I am all this, yet also its opposite. I am friendship. I am longing. I am courage. I am words. Language is all that separates me from the sea star, the sparrow and the spruce. Alike, our bodies respond to outside circumstances, attaching meaning to an object or event. The sparrow and I experience a similar rush of hormonal and neural changes when experiencing fear. But while the sparrow is afraid, I both feel afraid and know that I am frightened. This is self-awareness. In humans, consciousness manifests itself as an ability to think and act symbolically. Cavalierly I use common, everyday language to create, define, and guide me in being. I am because of words. I am life, awakened to itself. My fingers ruffled the book’s pages, searching for words that spoke to me in this moment, with its particular set of thoughts preoccupying my mind, with a certain heaviness of heart. Eyes danced down a page, skimmed passages, landed on a sentence that resonated. There, in the Sistine Chapel are Michelangelo’s hands: God’s outstretched and longing for touch–In the beginning was the word, and the word was with God, and the word was God–Adam’s languid finger almost too heavy to lift. I read Whyte again. Fifty-two workaday words. A year’s worth of weekly essays that, with restraint, could be savored. Yet I could not stop myself. I plucked a handful from his alphabet, reading word after word, passage after passage–alone, besieged, courage, friendship, loneliness, longing, vulnerable–filling my mind with words that I had not known mattered, deeply, personally. I read Whyte for a third time. I am lonely. Here. In this space that is public, yet in all other aspects private because of its obscurity, I speak into the silence. Like a ghost, I’ve haunted the blog for 11 years, the lifespan of my youngest child. Stealing moments out of my life, reveling in the temporary solitude, I have been happy. To write is a comfort. With few watching, the blog’s opacity frees me to live the questions and write my way to the answers. Here there is space to wander and wonder, and I am grateful, because my mind is often a conflict of commitments, a battlefield of should’ves and ought-tos and musts. To read another requires me to voluntarily and temporarily silence my own voice so that I might listen. The conversation with Whyte expands as layers of writing become an intimate and vulnerable discussion, irrelevant of time, space, even language. Nel mezzo del cammin di nostra vita. The first line from “Inferno.” But what does it mean? Dante and his translator, the poet Mary Jo Bang, joined Whyte in my head. Only a dense cage of leaf, tree and twig. I was lost. A reader gives a writer agency and purpose. To write and go unread is to be lost. At times I have considered turning off the blog’s comments section because it is a continuous reminder that what I write is lost, unread, inconsequential to most. But each time I have forced myself to continue to work in this public and vacant space, to listen to the answering silence that follows a post. Silence, too, is conversation. It is not of my choosing, but nothing can be done but to return again and again to this quiet, overlooked space to work with words. Not Whyte’s now, but mine. I am doubt. I am isolation. I am tangential. Whyte, Dante, and Bang have been thanked, and are, even now, being ushered to my mind’s door. I am certainty. I am independence. I am essential. I am life, aware of itself. I am a surge of hormonal and neural changes–emotion, shared and named. This, too, is companionship. Seeking neither Adam nor God, I stretch out a hand to touch the sea star on the tidal flat, pick up the sparrow feather, gather spruce tips in spring, and hold a pen. Woodcut by Agnes Miller Parker. Cell biologist Ursula Goodenough connects seed husk to deeply human feeling, love. “Consolations: The Solace, Nourishment and Underlying Meaning of Everyday Words” by David Whyte (public library). King James Bible, John 1:1. Dante’s “Inferno,” translated by poet Mary Jo Bang (public library). I wish I had a good meaty comment, but I am suffering from maternal fatigue and can only come up with this is beautiful and a pleasure to read. I’m looking forward to sharing more thoughts on it tomorrow. Thanks, Deborah. May you find the time to both rest and write–equally vital to a good life! I enjoyed reading this post. Thank you for writing it, Rachael. I’m happy to have read it in the morning, with a full day ahead of me. I know these topics will stay in my thoughts and influence the way I move through this Friday. Thank you, Denise. I’m glad you dropped by.